My clients often ask about shareholders agreements – whether it is a good idea to create one, how best to do so, and when to put one in place. Do you need an agreement at all? It is your choice whether to have an agreement with the other owners of your company. There is no law forcing you to make one. The main reason to write one is that unless you do, you have much less control over important decisions made for your company – decisions that could increase or reduce the value of your share of it. The law might give you some control over some decisions, but on other matters you’ll have none unless your agreement says otherwise. Because these documents are used so commonly, unless the ownership structure of the business is particularly unusual, most owners, particularly of small, uncomplicated businesses, should be perfectly able to use a good quality shareholders agreement template bought online as the basis for drawing their own document. But be aware, some templates are better than others. 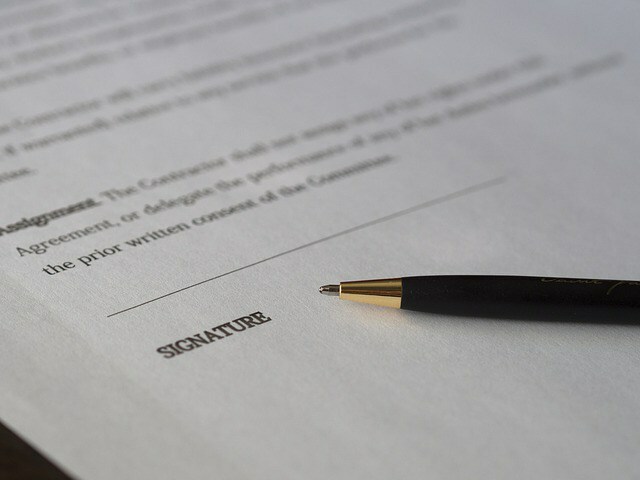 The coverage of key issues, the style of language and the structure of the agreement should all be considerations when choosing to buy from any legal document publisher. I’ve always planned to write reviews of the document templates I’ve used when helping founders set up new businesses. I haven’t quite ever managed it. My experience is that generally you pay for quality, and there isn’t much point in putting an agreement in place unless it is of high quality. In terms of the best templates I have seen and used, the ones I usually recommend are Net Lawman’s shareholder agreements. There are a number of templates offered for different ownership scenarios. Generally, the price points are high compared to some other retailers, but in my opinion the quality outweighs the cost, particularly in the number of options given and the notes that explain how to edit each paragraph. Some of these are very sophisticated documents that would take most solicitors considerable time to draw from scratch. The standard version is now free to download, and there are no catches to doing so. Versions with even more options and those for particular situations unsurprisingly are paid-for. There is also an option to create online (rather than just to use downloaded templates). Net Lawman’s lawyers can also review your final document once you have edited it. The review service is well priced – about the same as a solicitor would charge for an hour’s work. My second choice would be the one by CompactLaw. Here there is only a single choice of document, no review service and no online questionnaire option. However, the template itself is good. Why put an agreement in place yourself? Many people think that they need a solicitor or an accountant to draw up a company shareholders agreement. That isn’t true. Often, the business owners themselves are in the best position to decide how the company should be operated. The reason is that much of the subject matter of the document is not legal, but practical. Of course, there is law that must be complied with, but much of the document covers practical matters which only the owners themselves can decide on. The other common reason to write your own based on a template is cost. A solicitor (or an accountant) might charge from £300 to £2,000 for drawing a standard agreement. Compared to a charge-out rate of several hundred pounds per hour, this might seem reasonable – especially if the cost split between all the owners. But when you consider that the work that the professional does is essentially to customise a template, the value for money is much less. Solicitors themselves use templates to draw documents. Traditionally, many used what are called “precedents”, template paragraphs of text covering a single matter, to build up the document. Commonly nowadays, they download an entire document template, just as you might, from a legal stationer. A long yet comprehensive agreement is better than a short one that fails to address sufficiently all issues of control and management. Any legal contract should be to the point, but being short is likely to compromise the quality. You just can’t fit in all the important content in a document that is only one or two pages long. If you are worried that your fellow founders or owners are unlikely to sign up to an agreement that is more than a couple of pages long, you can do two things. The first is to summarise the key points of the agreement on the first page (sometimes, the key points are called heads of terms or a memorandum) before presenting the longer agreement behind. The second is to use a document that your fellow shareholders can read and understand easily and therefore gain trust in. A legal document does not have to contain complicated words and legal jargon in order for it to be legally binding. The idea of any document is to make sure that all parties knew what deal they were agreeing to when the document was signed. Indeed, nowadays, the inclusion of legal jargon can actually act to the detriment of the strength of the agreement. Find a template that is written in plain English. It will be much easier to edit, particularly if you want to add in more than the odd word yourself (likely with a shareholder agreement because so much of the content is personal to the owners). You will also be able to persuade your fellow owners to sign up to it more easily if they feel comfortable that they understand it. If they don’t insist on passing it by more lawyers to decode it, the overall cost will be kept down, and the agreement signed more quickly. Linked in to this point is use of a simple structure. When solicitors use precedents to draw a document, they often cross reference paragraphs because these paragraph templates are independent to each other. A good template will have been written by a lawyer who has made sure that each point does follow on from the previous. Your document should come with help as to how to complete it. This might be in the form of notes with the template, or it might be a Q&A system, or it might be post-purchase support. This type of document template should be straightforward to edit. The inclusion of some form of guidance indicates quality – that the person who has written the template knows what he or she is talking about, and that he or she has put time into making a well-rounded, well considered product for the end user and hasn’t just knocked off a document quickly. Price is a good indicator of quality. Free templates are available, but rarely are reasonable quality, let alone good. The price reflects the knowledge of the person who has drawn the document. The per hour cost of a solicitor is high. Drawing a good document takes time, as does maintaining it. There is a cost involved. Free shareholder agreement templates are unlikely to be maintained, and unlikely to have been written carefully. There may also be another catch with free templates. You may have to provide your credit card details and take up an expensive monthly subscription (if you don’t cancel in time). You may have to provide personal information that is subsequently used for marketing other products and services to you. By using a template, you are already saving considerably on the price of a solicitor. The benefit of the additional saving by using a cheap template is completely outweighed by the loss in quality. The scare stories about do it yourself documents are mostly as a result of poor quality, free templates being used rather than because of the DIY aspect. This is common sense, but do make sure that you know who has written the template that you use. The qualification of the author is second to the experience that he or she has. Many legal document retailer businesses are run by ex-solicitors, who no longer can call themselves that because of the Law Society’s restrictions on what services solicitors may offer. But often these owners have many years of experience of the law. If there is no mention of who has written the document, be very wary. It is easy to take a template and resell it as a download. The problem may be that the seller may not know (or care) whether the template is any good, or perhaps whether it is even valid for the laws of the UK. He or she is very unlikely to maintain it in line with changes in the law. Shareholder law does not change often, but nor does it stay still. Various changes to the Companies Act are brought out every couple of years. Make sure that the template you download has been reviewed recently and updated for any new, relevant law. Any reputable document retailer will publish customer reviews. These should include those relating to how good the document was, but also how good the retailer’s service was. Some customers (likely to be solicitors or accountants) should have enough experience to be able to leave expert reviews that will give you an insight as to whether the template is well written or not. Established retailers are likely to sell higher quality documents. Not only would mistakes in an agreement be noticed and corrected over time, but also subsequent revisions and improvements are likely to have been made. 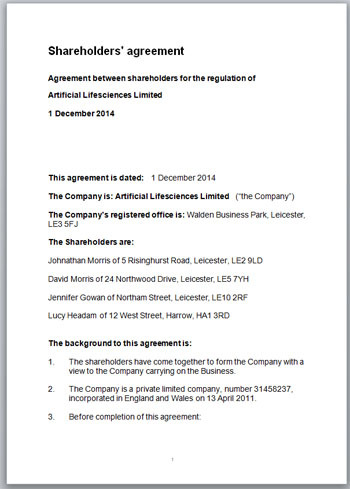 There are now several law technology companies offering shareholder agreement templates. You complete questions online and the document is created either as you type, or shortly afterwards. My own opinion, and those of various solicitors I have spoken to, is that these online-produced documents aren’t usually as good a solution as downloading and editing a template offline. One is that the deal between you and other shareholders usually requires all of you to consider all the options before committing words to paper. You can’t all huddle round a computer screen together at the same time. A second is that while technology needs investment capital behind it, the technology itself isn’t an indicator of quality of what is produced. These companies tend see themselves as tech companies that happen to operate in the legal industry, rather than lawyers who use technology. The attention is on the tech, and not on the document. Lastly, because these types of agreements are so personal to the shareholders, technology can only go so far in producing a customised document. The basics will be covered, but from experience, the online shareholder agreement software tends to lack the coverage of issues that templates for download do. Just as the provision of help is an indicator of a well thought out product, if a template can be edited without needing to be an expert in word processing, it shows that someone has thought about how to make a good quality document that anyone can use. The best way of making sure there is no requirement to have your own software installed is to provide editing functionality online. That certainly is an advantage of the technology based retailers. However, offline access also has advantages. You are likely to want to draft your document in stages, with consideration by all parties at each. You’re not likely to create it in a single session. You will want to format it and style it. You will also want to print it out or e-mail to other company owners for revision and approval. Templates in file formats that are compatible with common word processors such as Microsoft Word, WordPerfect, Mac Pages, OpenOffice and LibreWriter give you access to the functions of those software products. For example, track changes functionality is very useful when collaborating on a legal document. Note that you are going to have to edit your document. You won’t find one that fits out of the box, where you simply have to fill in your names and sign. Adobe Acrobat (PDF format) isn’t a good format to use because it can’t be edited easily. What should your agreement cover? Although your document can cover strategy and objectives, you shouldn’t confuse your shareholders agreement with your business plan. Your agreement should cover issues relating to ownership and control, not company objectives. Putting a new shareholders agreement in place requires the approval of all company owners. Drawing up a new agreement can be started by just one person, but eventually all owners will want to give input. Note that the agreement is private between the shareholders. The directors do not have any involvement (unless they are also owners), and the agreement is not required to be filed publicly (such as at Companies House). We find that the following process works well. One shareholder proposes to the others the structure of the new agreement (effectively summary points). He or she might use a template to identify the key points. Usually, using several templates works best. A working draft is circulated, and the other shareholders are requested to add any matters that may have been missed out. These newly incorporated points are usually those that are most important to each. It is a good idea to ask why they are being included. The co-ordinating shareholder lists the changes that the others have made, such as “John Smith requests that if any decision about the appointment of additional directors to the board is done on a one person, one vote basis. This is because he feels that…”. Those changes are circulated. Negotiations can then take place between shareholders based on principled positions. The final summary of terms is written up and agreed. The agreement is drafted, using a template as the basis. Each point agreed in summary is checked to be included accurately and fully in the final document. The final document is circulated to the owners. Owners can then sign, or request further changes. Shareholders do not need to call a meeting, or be together to sign. They can sign in private. However, it may be a good idea to insist on each signature being witnessed to ensure that the signature is that of the shareholder. Some shareholder agreement template providers also offer a final document review service, either using in-house lawyers, or outsourcing the work to a “panel” firm. Having your final document reviewed can provide much reassurance to all shareholders that the agreement is above board and does what it is supposed to do. It is also much less expensive than asking a solicitor to draw up the document from scratch, and is a good alternative proposition if one of the shareholders wants a solicitor to be involved in the production of the document. Who Should Be On The Board Of Directors Of Your Start-Up? Are Shadow Directors Lurking in Your Start-Up?